The FROG-7 is a battlefield support artillery rocket system dating back to the Soviet era as one of their most vital tactical nuclear warfare options during the Cold War. Able to lob over 1000 lbs of explosives to a distance of 42 miles, the system may be obsolete by first world standards, but it remains an important part of arsenals throughout southern Asia. Additionally, it is on the verge of becoming an important terrorist tool. 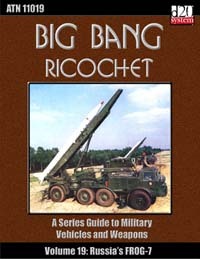 Along with explosive warheads, the rockets can be fitted with chemical and nuclear weapons as well as cargo warheads to scatter bomblets and mines. Already a number of FROG-7 launch vehicles and working rockets have been recovered from Taliban weapon caches in Afghanistan and the global intel community suggests that Hezbollah in southern Lebanon has been obtaining the FROG-7 and similar systems since summer 2004. The FROG-7 is not a typical weapon for game use, but rather an overkill used primarily as a plot device. Why is it overkill? Under the existing rules, the 1100kg high explosive warhead would do more than 2,200 d6 worth of damage and have a blast radius of nearly one half mile. With these "plot device weapons", adventuring centers around the use of the weapon, while combat does not. Maybe the adventure requires transporting the weapon. Maybe the adventure requires firing it on the bad guys. Or maybe you need to stop the bad guys from firing it. But these weapons can never be fired at you directly. Along with notes in the introduction, we have included a one page essay on effectively utilizing such overpowering weapons as plot devices without destroying your game.